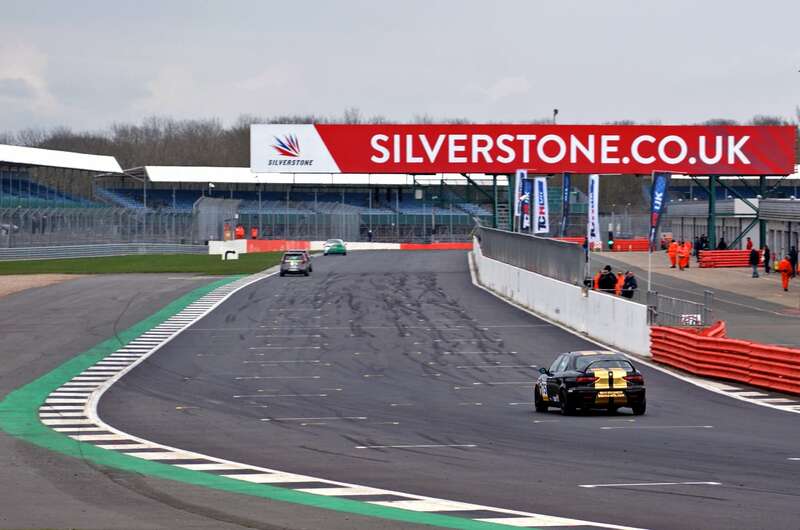 Those who went to Silverstone for the Friday test in advance of the weekend’s racing got in some useful track time earlier in the day, but as the afternoon wore on the rain had become an absolute deluge and drivers came in one by one to abandon the day’s lappery. The track was awash with water and nothing useful could be learned by staying out on it any longer. 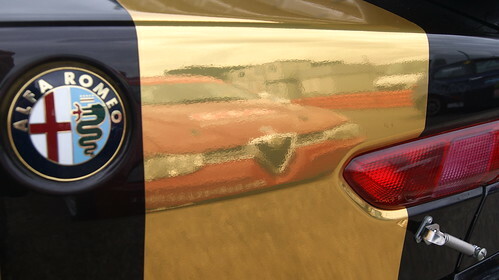 By late afternoon there were no people visible in the Alfa Romeo section of the paddock as everyone had retreated indoors to escape the rain and the icy wind. It would be refreshing to report that Saturday dawned bright and clear after the previous day’s washout, but it didn’t. However, the rain had become intermittent: showers were forecast but not continuous rain. 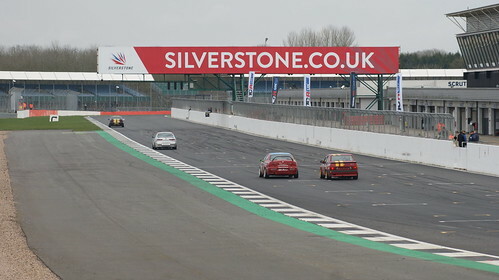 The wind, so characteristic of Silverstone’s open aspect, continued to blow hard only a few degrees above freezing and it was clear that conditions were still going to be very challenging. 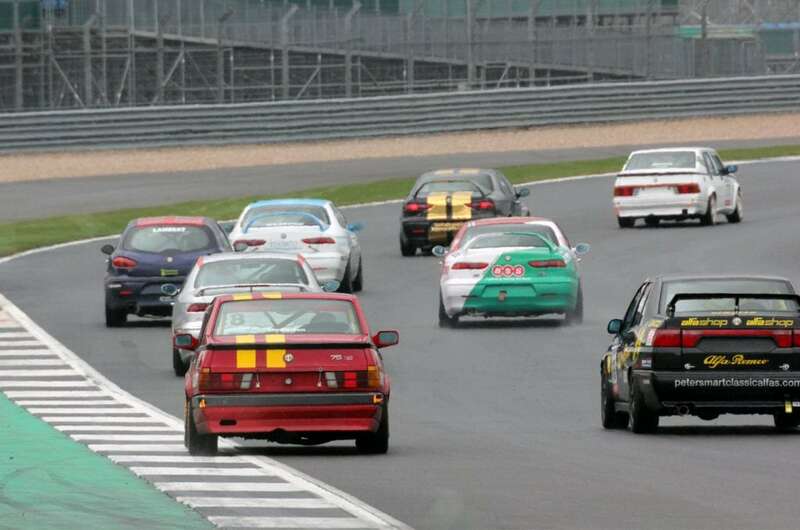 We had 17 cars on the entry list, a welcome increase from the 15 listed earlier in the week. 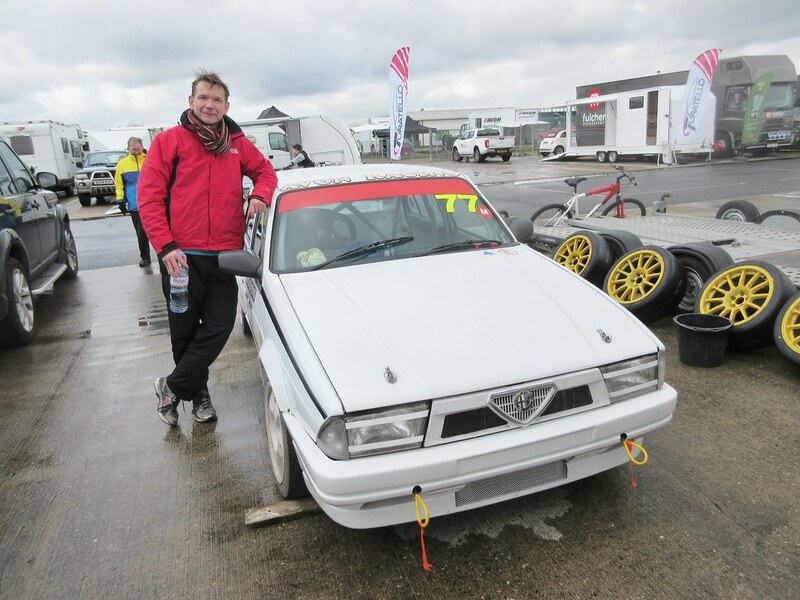 The sole Modified entry was Chris Oxborough’s rebuilt 75, looking resplendent in all-white paint and ready to race again after a gap of 2 years. 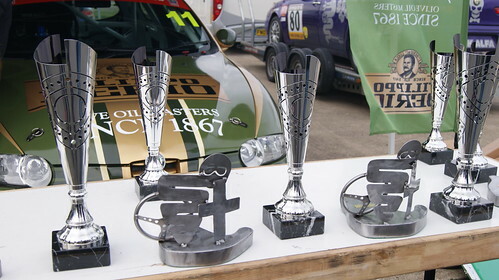 In the Power Trophy class there were a very respectable 5 entries, a welcome improvement from previous years, and there are at least 3 other drivers who will be joining in during the year so this promises to be a much more competitive class this season. 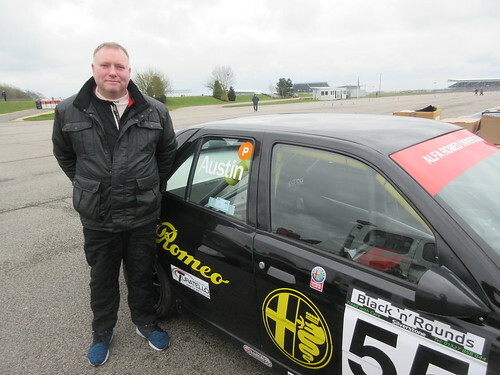 Last year’s Class winner, Paul Webster, was back with the ex-Clive Hodgkin 156, recently back from its official rolling road test, and was expected to be one of the cars to beat. 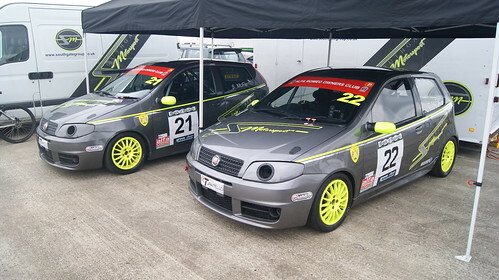 The Abarth Puntos of Chris and Simon McFie were looking beautifully prepared and competitive as always and now able to score points in the PT class. 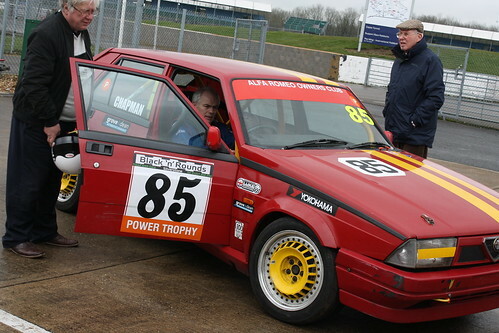 Malcolm Chapman was making a return to the Championship in his 75 after a 4-year absence – welcome back Malcolm! 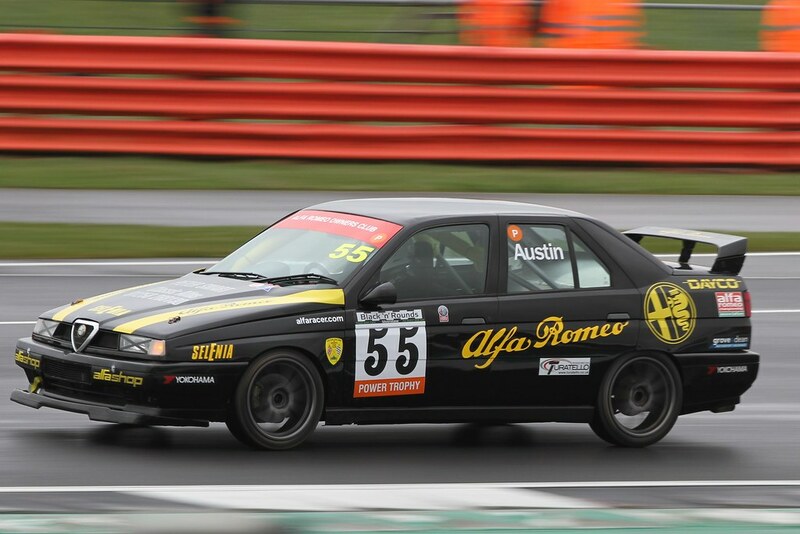 And last, but by no means least, it was a delight to see the 155 that Scott Austin had bought from Ian Brookfield over the winter back on the track, repaired after its accident at Brands last year. 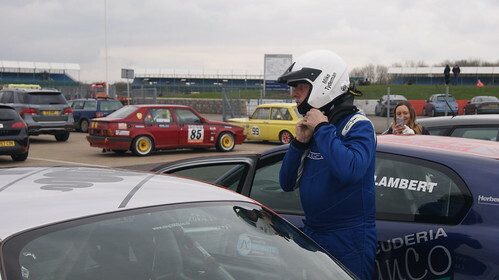 Having not raced for over 2 decades Scott was a little apprehensive beforehand but hoping to settle in to competitive driving again without too many dramas. 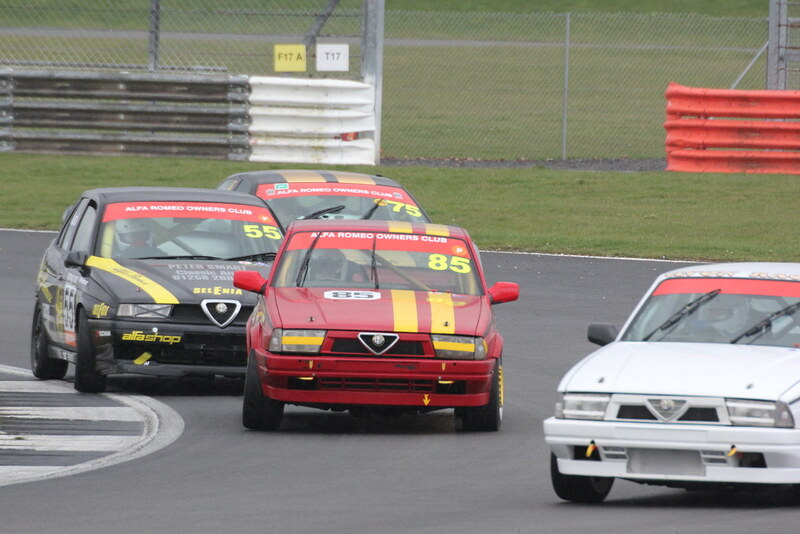 The 11-car Twin Spark Cup entry included one driver completely new to the Championship: Cip Nistorica in the ex-Paul Plant 156, with Italian-flag colour patches now added. Cip’s company, Turatello Trailers, is sponsoring the Twin Spark Cup trophies this season and he had brought along two of his very classy looking trailers to display to interested parties. They look to be a very high quality product and different to the traditional UK trailer market offerings, so we wish him well in acquiring a healthy market share. A second driver, Riccardo Losselli, was nearly completely new to the Championship, having done only one previous race meeting. 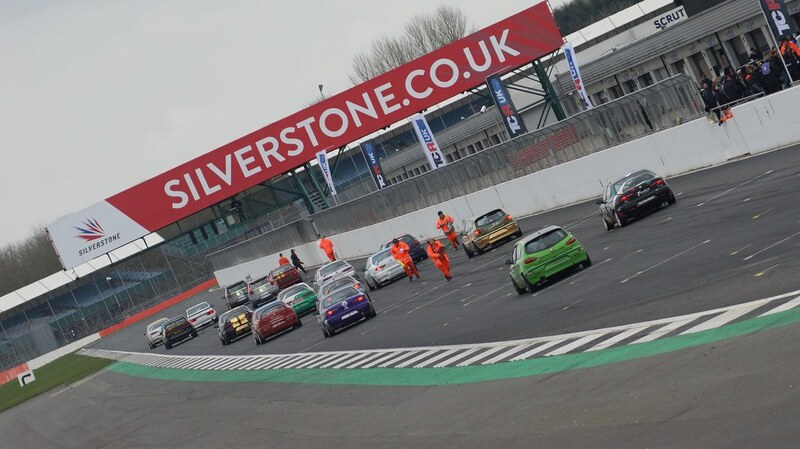 Riccardo arrived at the circuit in a black 4C, his regular track day car, and was looking forward to doing a full season in the green ex-Jon Billingsley 147, prepared for him by Bianco. Three drivers were making a welcome return to the Championship after a gap of a year or more. 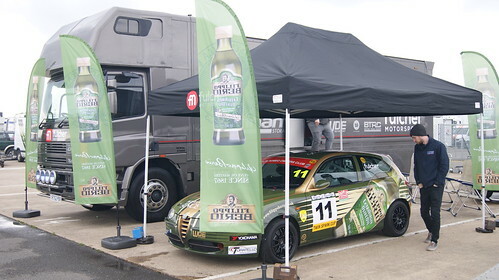 Andrew Fulcher had landed a major sponsorship coup with support from Filippo Berio, a well known and top quality producer of Italian food products: Olive Oils, Pesto sauces, Vinegars and Snacks. The car looked stunning and immaculate, completely wrapped in Filippo Berio livery and Andrew was making a welcome return after a year away truck racing. Another semi-new driver was Kristian Leith, back racing with us after a 4-year absence and competing for a full season in a metallic blue 156 recently built by Bianco. 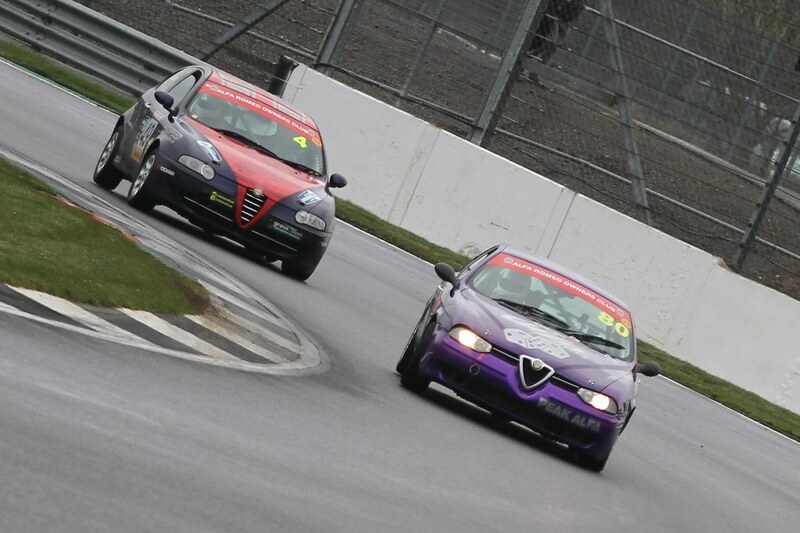 Travelling to distant circuits is difficult for many drivers given their other life and work commitments, and in journeying from the Shetland Isles Kristian faces many potential time management difficulties so it is brilliant that he is back racing an Alfa with us and with plans to do a full season. 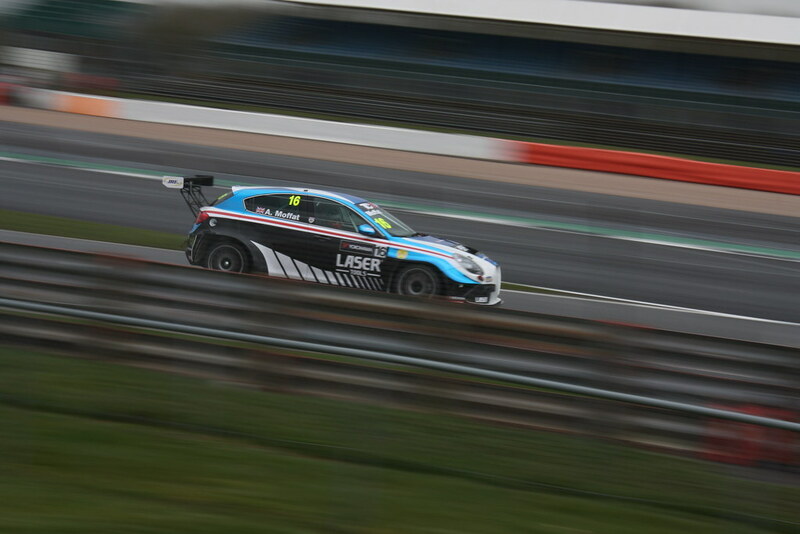 Likewise with Josh Lambert: Josh hadn’t competed in the Championship since Rockingham at the end of the 2016 season but is back with plans to do a full season in his dark blue and red 147. Josh is a quick driver and is sure to benefit from competing more frequently. 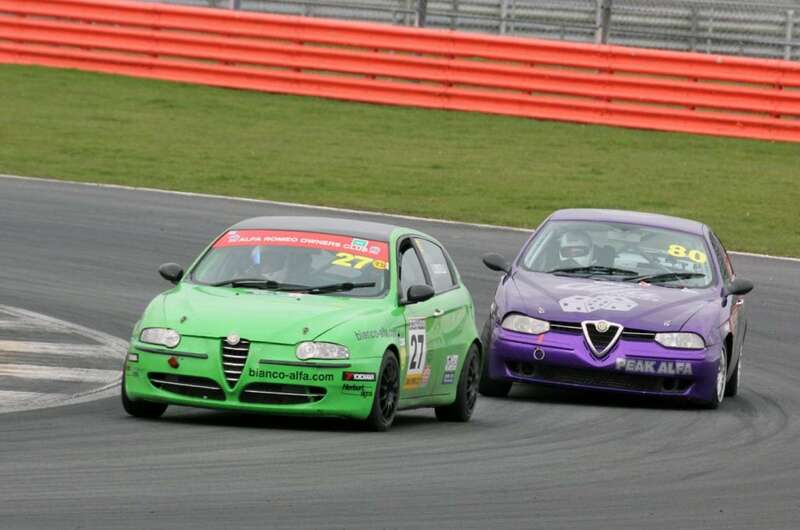 The other Twin Spark Cup drivers all had much more Championship experience, so where to start…? Tom Hill’s re-shelled and redeveloped 156 looked superb in gleaming black paintwork, with his previously more muted stripes replaced by vivid gold ones. The time and care that had gone into its preparation was clear for all to see and if it went as well as it looked then it was going to be very hard to beat in Tom’s talented hands. 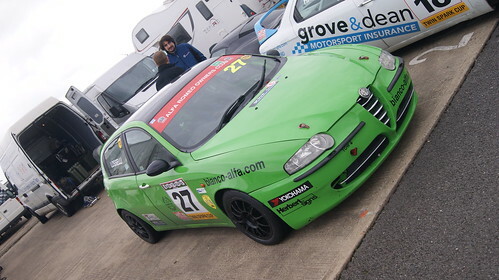 Dave Messenger’s 156 had also had an overhaul and a visit to the paint shop over the winter and looked excellent in its familiar red, white and green livery with sponsorship from Darnells, BSS and Solo Italia. 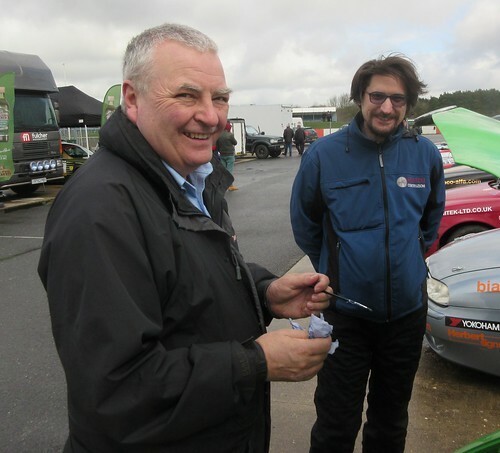 Dave is always going to be at or near the front of the Twin Spark class and will be determined to improve on the 5th overall position in the Championship he achieved last year. 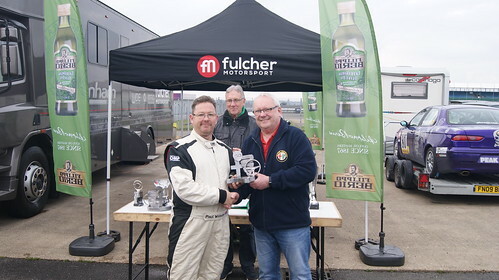 Richard Ford, who was making his first competitive visit to the National circuit, had only been able to compete in 3 of the 8 race meetings last year, performing well in those and planning to increase his participation this season. He had worked hard on his red 156 over the winter and is determined to challenge for even higher placings this year. 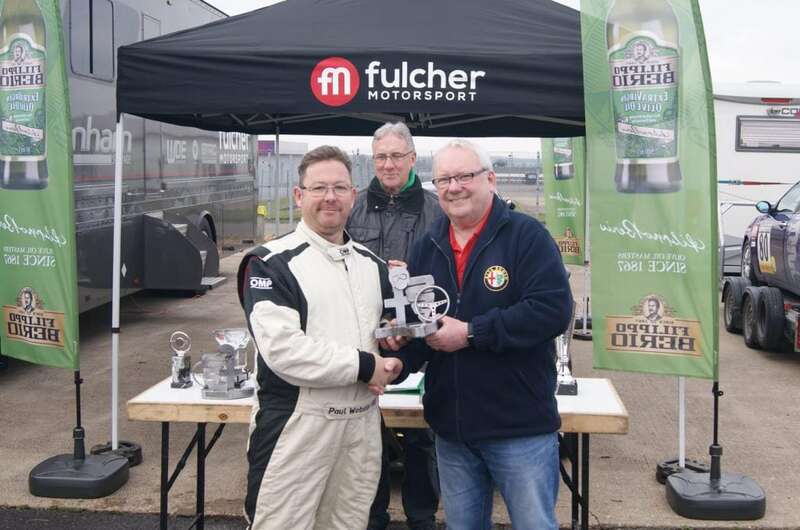 Mike Tydeman had enhanced his competitive qualities with improving results last year culminating in a 4th place overall in the Championship – and was back in his seasoned silver 156 and hoping to manage the cost of a full season. 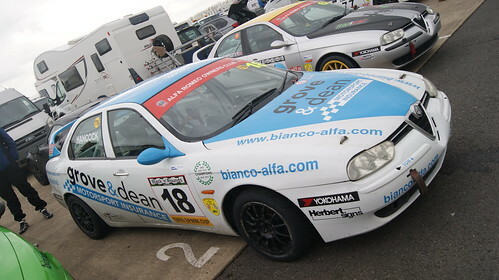 Another welcome returnee was Andy Hancock in his blue-and-white liveried 156, with support from Grove and Dean. His brace of race victories at Donington last October was very impressive and he was sure to be there or thereabouts in the mix here. 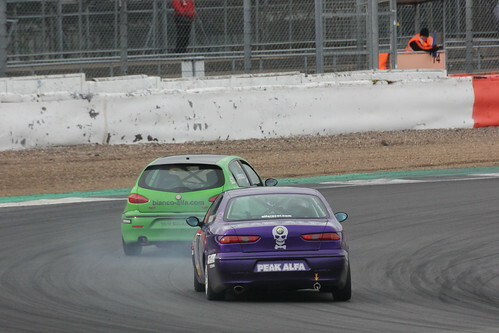 Last but absolutely not least, Andy Inman was back in his purple and uniquely liveried Peak Alfa supported 156, complete with new engine. As a character, Andy is a complete one-off and as such is invaluable to the Championship with his inimitable Geordie humour. As well as being the scourge of flag-waving start line officials he is driving as well as ever. Keep going Andy! Looking at the track surface on the start/finish straight it didn’t look too slippery even though wets were the choice of nearly all the Modified and Power Trophy runners. 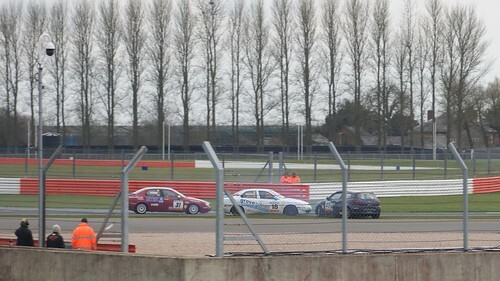 Driving down the start/finish straight reinforced that notion; turning into Copse Corner, however, quickly dispelled it! 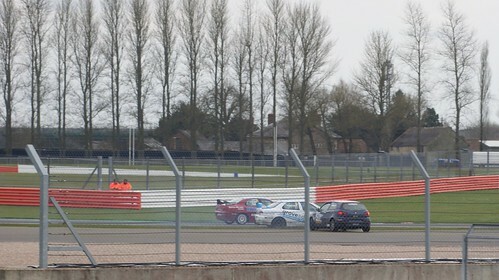 It was very slippery, and not only at Copse. 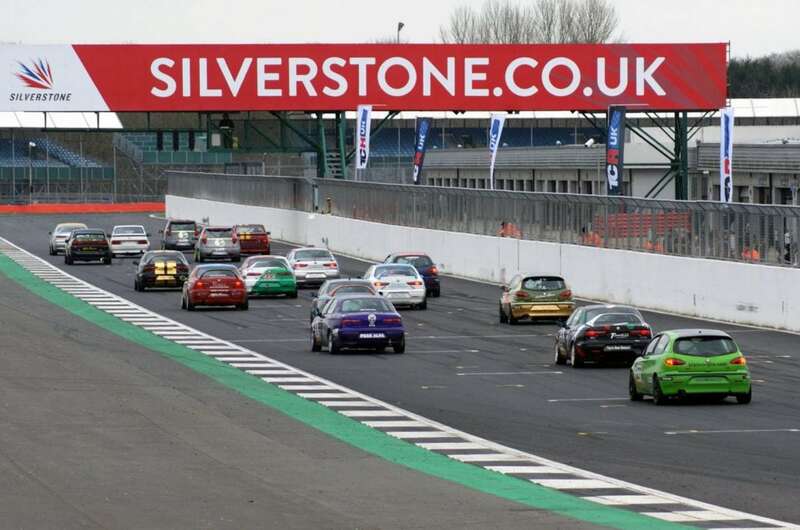 Maggotts and Luffield were reportedly just as tricky and this meant that the conditions were going to level the performance differences between the classes. There was heavy dampness at all the braking points and, as if this wasn’t enough, it began to rain again quite heavily part way through the session, compounding challenges facing the drivers. Notwithstanding this, many of them turned in their quickest laps towards the end of the session. First into his stride was Tom Hill, with a 1:15.815 on only his second lap, and visibly more committed in the corners than most others at this stage, apart from Chris McFie and Andy Hancock who were quickly up to speed. Chris posted a 1:15.187 on his 3rd lap and bettered this with a 1:14.999 on his 5th to top the times at this stage. Meanwhile, Chris Oxborough had been finding the 75 a handful in the tricky conditions and had spun backwards into the sand at Maggots. For several laps all the other drivers’ times were compromised by waved yellows there before Chris was towed out undamaged and resumed. Tom Hill pitted on lap 5 but re-emerged to record his best time of 1:14.518 on his 12th lap and take pole position, over a second quicker than the next Twin Spark. Chris McFie’s lap times had dropped off for a couple of laps but just as he began to pick up the pace again the car sheared a wheel bolt on his 9th lap ending his session, but at the end he was still 2nd quickest overall. 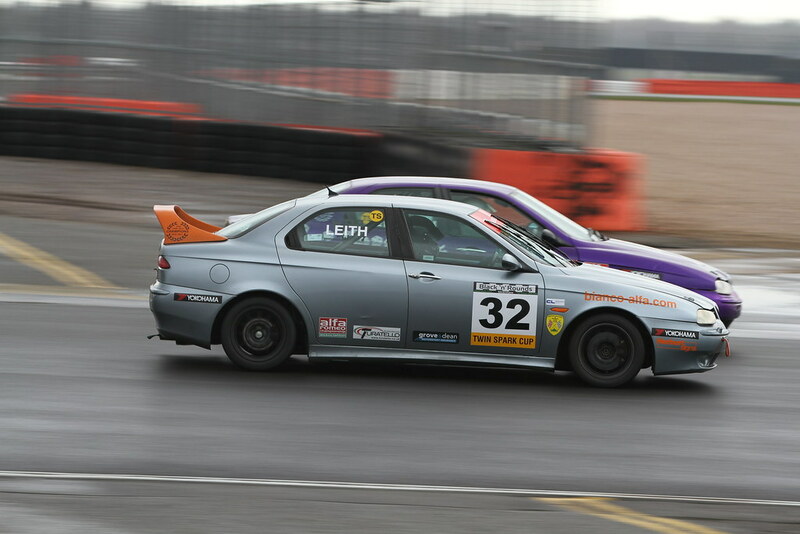 An undoubted star of qualifying was Josh Lambert. After a series of laps in the 1:18s he began to go progressively quicker, drifting the car confidently out of Luffield, before posting a 1:15.666 on his final lap to go 3rd quickest. Andy Hancock’s first few laps were a bit up and down but after pitting briefly on his 7th lap he got stuck in and worked his way steadily down to a 1:15.791 to be 4th quickest. Dave Messenger banged in a consistent set of times over his last 7 laps before posting a best time of 1:16.222 on his very last lap. He then broke a drive shaft just after crossing the line and pulled off at Copse – if it had to break this was at least good timing on the part of the component! It would be replaced in good time for the race. Paul Webster was one of the favourites for an overall race win but seemed to be driving relatively conservatively in qualifying, probably wisely in the conditions as it was difficult to get the power down. Nevertheless his 1:16.916 was good enough for 6th quickest. Less than a 10th behind Paul was Kristian Leith. Most of his laps were in the 1:20s – one of which featured a spectacularly long sideways slide on the exit of Copse culminating in an excellent save! However, in his last few laps of the session he got into the 1:17s, recording an excellent 1:17.014 to go 7th quickest overall. Only 1/1000th of a second behind Kristian was Mike Tydeman. Mike went steadily faster through the session, becoming more confident in the conditions before posting a 1:17.015 to be 8th quickest. Early on, Andrew Fulcher seemed to be feeling his way into things with a series of laps in the mid 1:20s but after pitting on his 6th lap he improved significantly, overtaking slower runners and leaning on the car a little more, finishing with a 1:17.187 on his very last lap to end up 9th quickest. Andy Inman looked more and more smooth and confident as the session progressed, finishing up 10th quickest with a 1:17.442 on his 13th lap, an excellent effort. Richard Ford had something of a torrid qualifying session. His initial lap times were respectable but in his efforts to improve on the 1:18.218 he posted on his 9th lap he spun at Luffield. He then worked his way down to 1:17.519 on his penultimate lap before another spin on his final lap, this time at Copse. He finished 11th quickest citing his tyres as the main culprit, a judgement which proved to be accurate after he changed them for the races… Riccardo Losselli did his quickest time – a 1:18.799 – on only his third lap. Unfortunately he was then sidelined by clutch failure, necessitating its replacement for the first race. He therefore had to settle for 12th quickest. After his spin at Maggots early in the session Chris Oxborough was naturally tentative, finding his 75 a handful in the conditions, but recorded a 1:18.842 on his very last lap to be 13th fastest. 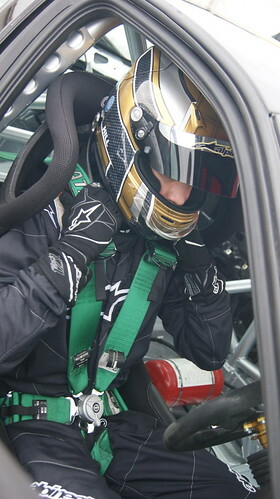 Cip Nistorica, in his first Championship race, was naturally taking some time to adapt to the car in the difficult conditions but, like many others, put in his fastest lap of 1:18.903 just before the end. Just over a second adrift of Cip was Malcolm Chapman, who drove cautiously through the session to post a 1:20.204, again on his penultimate lap. Not quite finally, Scott Austin had decided to opt for slicks on his 155 in qualifying – a risk that did not pay off! Grip was impossible to find in places and with the straight line speed of the car still ‘work in progress’ Scott had to settle for a best lap of 1:24.314. So, what had happened to Simon McFie? He had followed his brother Chris to the Assembly area but I suddenly had a call from the Clerk of the Course to say he hadn’t arrived. Mystified, I hurried back to the Paddock to find he had returned, having failed the noise test and not been allowed into the Assembly area as a consequence. An improvised solution involving an empty coffee can brought the noise level down but he was still not allowed out, so Simon missed the qualifying session. After a lot of head scratching – it was the same exhaust system that had passed the test all last season – it was finally ascertained that the marshal had asked for much higher revs for the test than he should have and the car passed a third noise test with ease. 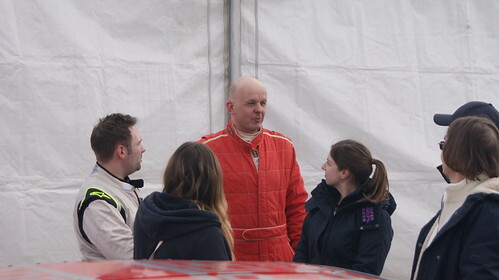 A call to the Clerk of the Course enabled him to get out and complete the requisite number of laps on his own between races to enable him to start at the back of the Modified/Power Trophy section of the grid. Phew! As the red lights went out for the first section of the grid the front row of Paul Webster and Chris McFie both got away well and were side by side through Copse and all the way down to Maggotts. However, Paul utilised the extra power of the 156 to good effect on the Wellington Straight and led into Brooklands, crossing the line 2.7s ahead of Chris. 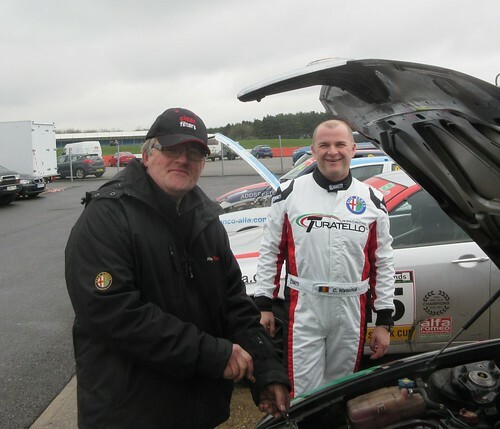 Sadly, almost immediately, Chris pulled off the circuit at Copse with a broken throttle cable. 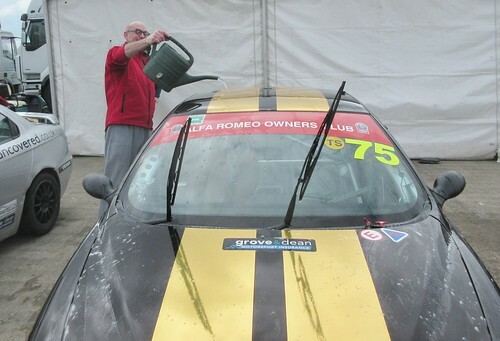 However, Simon McFie then took up the challenge in his Abarth, having passed all the other Modified and Power Trophy runners on the first lap and whittled Paul’s lead down from 2.9s to 2.0s over the next 2 laps. At the end of lap 2 there was a gap of 3 seconds from Simon back to Chris Oxborough, followed by Malcolm Chapman and Scott Austin a further couple of seconds back, Malcolm having now passed Scott. 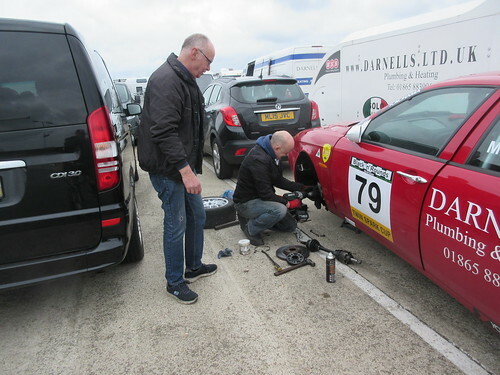 Meanwhile, the Twin Sparks had started, apart from Riccardo Losselli who had pulled off the circuit on the green flag lap with gear selection problems caused by a spongy clutch pedal. Tom Hill got away well from Twin Spark pole position, survived a passing attempt by Josh Lambert, and by the end of Lap 1 had opened up a 1.5s gap to Josh who now had Andy Hancock pressurising him closely from behind, himself followed equally closely by Dave Messenger. There was then a 1.5s gap to Mike Tydeman, followed by Andrew Fulcher, Andy Inman, Richard Ford, Kristian Leith and Cip Nistorica in that order. Kristian had been caught out at the start, having been late for the Driver Briefing earlier and received only a shortened version of it which excluded a reminder about the Flag start procedure. In his haste to make up for this he selected 5th gear instead of 3rd approaching Copse Corner and dropped from 5th on the Twin Spark grid to second last at the end of Lap 1. At the front Tom Hill had caught up to the slower Power Trophy runners at the end of Lap 2 and immediately passed Scott Austin. Tom had opened up a gap of over 2s to Andy Hancock who had passed Josh Lambert, with Dave Messenger right behind Josh. 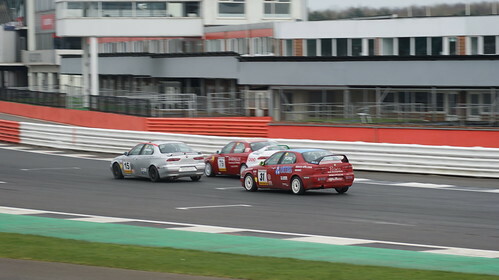 By the end of Lap 3 Dave and Josh were side by side fighting for 5th place overall just 0.6s behind Andy, having passed Scott Austin, as had Mike Tydeman who was closing rapidly on the 3-way battle ahead. 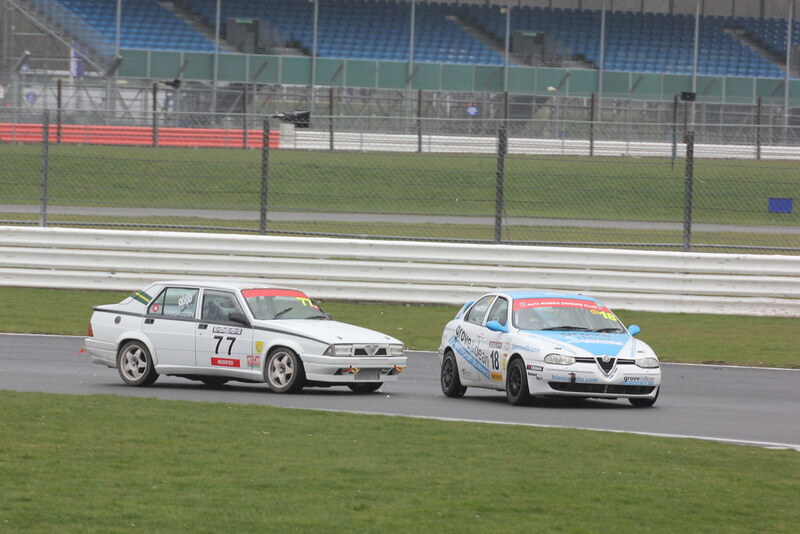 Things went awry on Lap 4 as the group came up behind Chris Oxborough, still struggling with the balance of his powerful 75, in the Brooklands/Luffield complex. 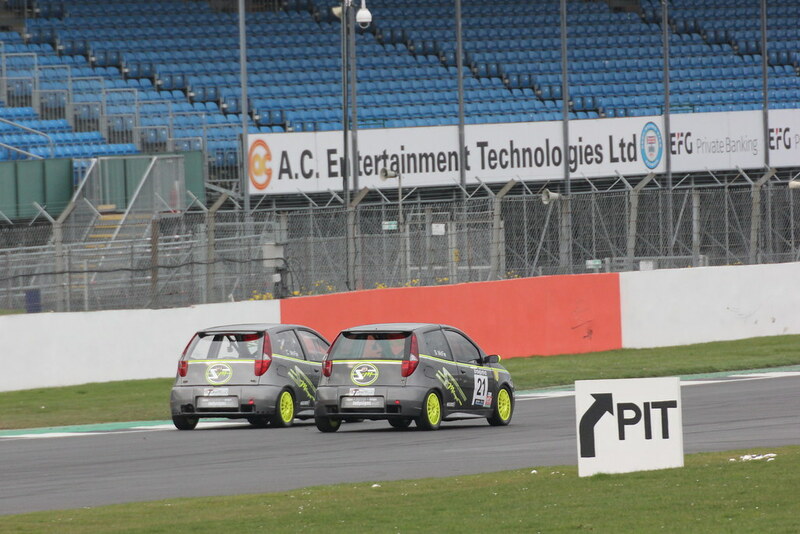 Chris was ahead going into the left hander but was passed by Andy approaching the right hander that followed. As Andy exited the corner there was contact between him and Chris, pushing Andy into a half spin and delaying him enough to let Dave and Josh through. Crossing the line at the end of Lap 4, Tom had a 1s gap over Dave but then only 1.5s covered Josh, Andy, Mike and Chris. 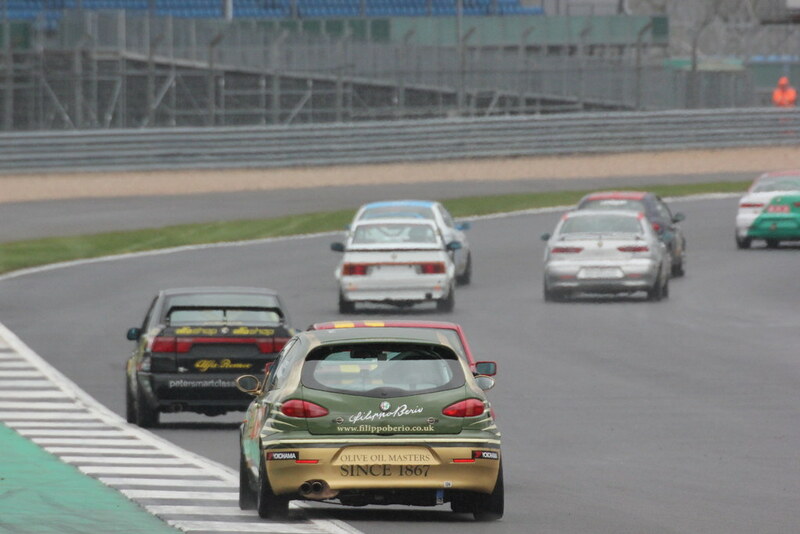 Behind Chris, Scott Austin had re-passed Malcolm Chapman, who was now closely followed by Andrew Fulcher. Richard Ford had passed Andy Inman on Lap 2, and behind Andy were Kristian and Cip. At the front, the gap between Paul Webster and Simon McFie was varying between 2s and 3.3s over the next 3 laps but then Simon’s pace slowed a little and by Lap 9 the gap had grown to 5.2s, with the result that Tom Hill, who had put in a series of 1:14 laps and even dipping into the 1:13s on Lap 7, was now right behind Simon. At the end of Lap 10 he had got through into second, passing Simon on the inside of Brooklands; it lasted another lap before Simon reasserted himself and reclaimed the place. Behind them Mike Tydeman was on a charge: he passed Andy Hancock on the Luffield exit on Lap 7 and on the next lap passed Josh Lambert on the inside of Brooklands. 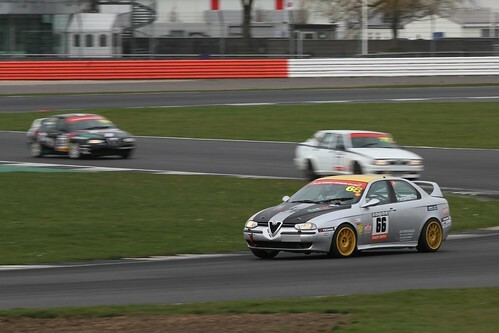 On Lap 10 he was right behind Dave Messenger going into Luffield and had passed him by the end of the lap to move into 2nd place in the Twin Sparks and 4th place overall. Dave tried to go inside Mike at Brooklands but the door was firmly shut and Dave was forced to lift. Further back, Richard Ford was making steady progress, passing Andrew Fulcher on Lap 5, Malcolm Chapman on Lap 6 and Scott Austin on lap 7. 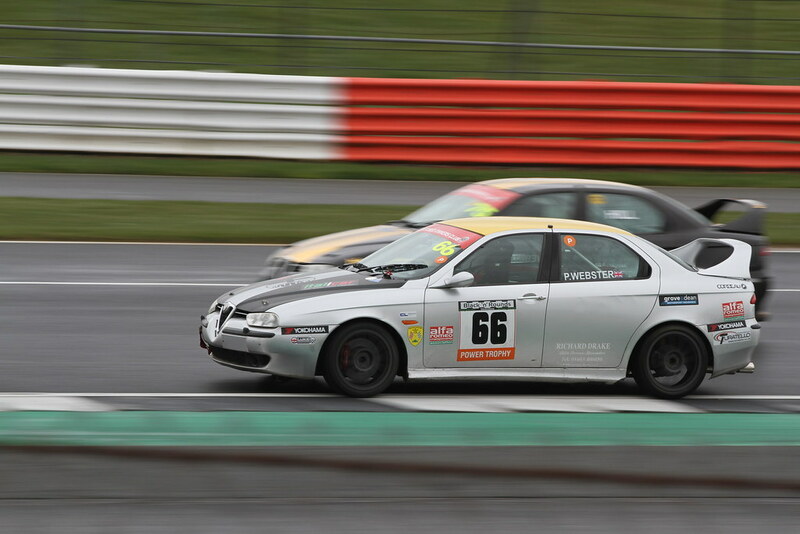 He then came up behind Chris Oxborough but could not find a way through, matching Chris’s lap times but unable to get past due to the 75’s greater speed on the straights. At the end of Lap 12 the running order was Webster, 4.9s ahead of Simon McFie, Hill another 0.5s back in 3rd, then an 8 second gap back to Tydeman in 4th. 5th was Messenger followed by Lambert and Hancock at 1s intervals. Oxborough was 8th, followed by Ford, Leith (who had passed Andy Inman, Scott Austin and Malcolm Chapman), Chapman, Austin, Fulcher (who had a ‘moment’, half spinning at the exit of Brooklands and losing 2 places), Inman and Nistorica. Cip had had a slow first lap and dropped steadily back after that, clearly finding the conditions difficult, unsurprisingly in his first race in the Championship. After Lap 12 there was little change in the order. The rain was falling hard again and track conditions worsened. On Lap 13 Andy Hancock spun at Copse Corner and lost 5th place in the Twin Spark class to Richard Ford and a place to Chris Oxborough, dropping to 9th place overall. 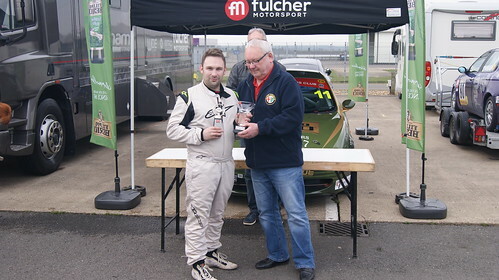 Scott Austin also lost places to Andrew Fulcher and Andy Inman. 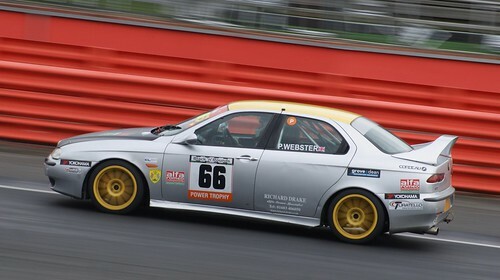 At the flag, Paul Webster claimed his first overall win in the Championship and a fastest lap of 1:13.897 on Lap 14 in what was a fine drive, unchallenged after the first lap. 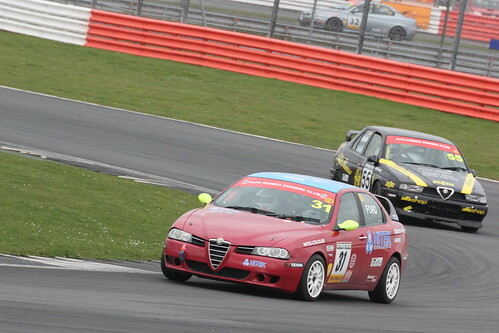 Simon McFie also drove a fine race, the nimble Abarth handling well on the tricky surface, keeping Paul honest though unable to mount a challenge for the lead. In 3rd place Tom Hill was clearly the class of the Twin Spark field, the only driver apart from Paul to dip into the 1:13s. It was a fine drive by any standards, committed and skilful in challenging conditions, and finishing over 10s clear of Mike Tydeman in 4th place. Mike had been 11th at the end of Lap 1 so this was a great result. Dave Messenger kept trying to the end, matching Mike’s lap times but just finishing 0.7s adrift at the flag. Josh Lambert was a very creditable 6th overall, followed home by Chris Oxborough, Richard Ford, Andy Hancock, Kristian Leith, Malcolm Chapman, Andrew Fulcher, Andy Inman, Scott Austin and Cip Nistorica in that order. 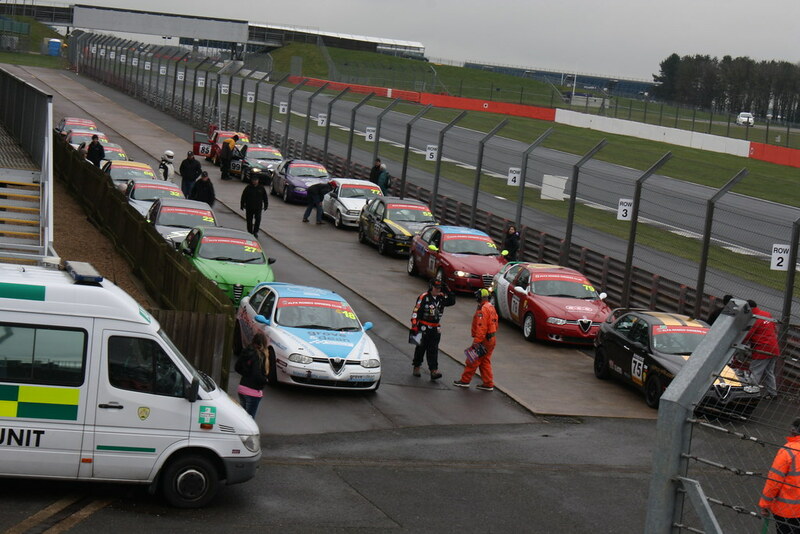 The fact that all 16 starters finished was a credit to the drivers, applying themselves on a very slippery track in buffeting winds and intermittent driving rain. 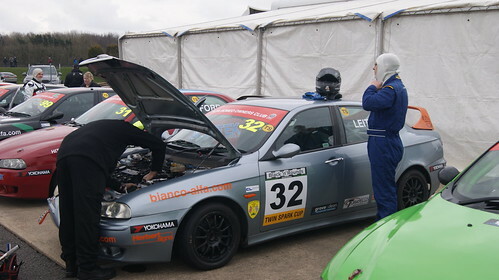 There was then a long 24 hour wait to Race 2 late on Sunday with all hoping for better weather and dry track conditions. Sure enough, our luck held: Sunday was overcast and chilly but stayed dry. 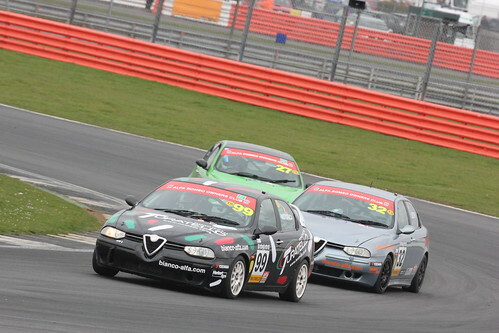 We were out on track just after the second TCR UK where the Alfas were impressively quick but sadly had mechanical issues. 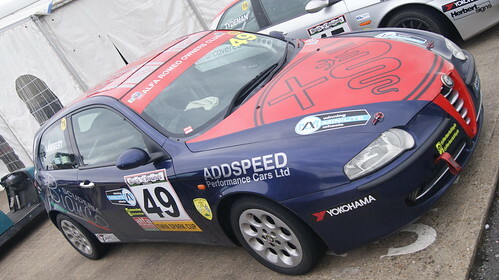 Former Alfa racer Darelle Wilson had finished 7th in his Vauxhall Astra. From the outset it was clear that Chris Oxborough’s 75 was going to be a different proposition in the dry but Paul Webster again made an excellent start and led the field through Copse followed by Chris Oxborough, who had passed Simon McFie on the run down to the corner, the 2 Fiats of the McFie brothers, Malcolm Chapman and Scott Austin. However, by the end of Lap 1, Simon McFie was edging out the white 75 before the power told again and Chris was ahead again through Copse. Chris McFie was 4th, followed by Chapman and Austin, 5s adrift of the leader but already showing improved pace in the dry conditions. In the Twin Spark class Tom Hill made an excellent getaway and led the second group through Copse with Mike Tydeman close behind. At the end of Lap 1, Tom and Mike were still 1st and second, followed by Dave Messenger, Josh Lambert, Andy Hancock, Richard Ford, Andrew Fulcher, Andy Inman, Cip Nistorica, Kristian Leith and Riccardo Losselli. At the end of Lap 2 the order was the same with the exception of Andy Hancock and Josh Lambert, who had a coming together at Brooklands dropping Andy back a couple of positions and Josh regaining the circuit in last position. At the front of the field, Paul Webster had worked his way down to the 1:09s and put in a remarkably disciplined and consistent series of laps in the 1:09s and 1:08s throughout the rest of the race, recording fastest lap on his 18th and final lap of 1:07.809, almost 4 seconds inside Ray Foley’s inaugural power trophy lap record set on our last visit in 2016. 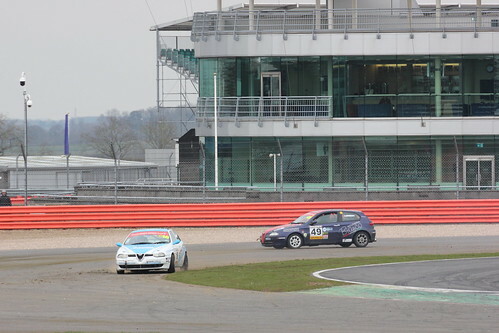 In the early stages, Paul had pulled out a 5s lead over Chris Oxborough and at the end of Lap 6 the gap was 6.4s. However, after that Chris was well into his stride and was quicker than Paul for the next 12 laps in a row, sometimes only by a tenth or so, sometimes by a few 10ths, and on Lap 13 by nearly a second, but he ran out of time in the end, finishing 2s adrift at the flag but recording the fastest lap of the race, a 1:07.524 on the final lap. The dry track and the straight line speed of the first two meant that the 2 Abarths fell progressively further behind them, but they were very evenly matched and had their own duel, swapping places and never more than a few feet apart. They looked a great sight dicing down the start/finish straight together lap after lap until, that is, the very last lap when Chris McFie’s car suddenly lost drive out of the blue and Simon was left to take the chequered flag alone in third place overall. The other 2 Power Trophy runners dropped slowly down the order as the quicker Twin Sparks caught them. Malcolm Chapman was lapping consistently in the 1:12/1:13s until he had to pit with mechanical problems on lap 16 and sadly was unable to continue and complete a solid consistent drive. Scott Austin was also much happier in the 155 in the dry conditions and was classified 11th overall at the flag with a best lap of 1:12.925. There will be more to come from the car and from Scott as the season progresses. In the Twin Sparks, Tom Hill had established a lead over Mike Tydeman, but the gap oscillated – Tom would pull out over a second ahead but then Mike would pull closer, only for the gap to widen again. 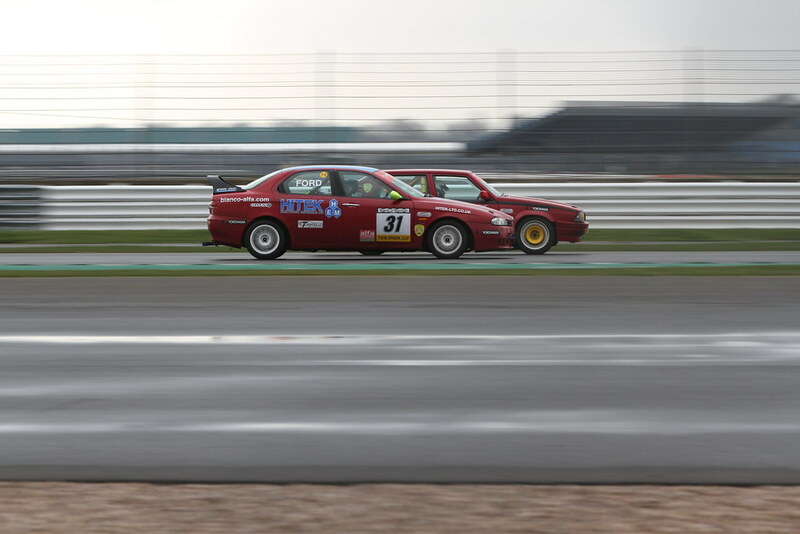 Meanwhile, Richard Ford was making rapid progress moving up a couple of positions past Andy and Josh on lap 2. 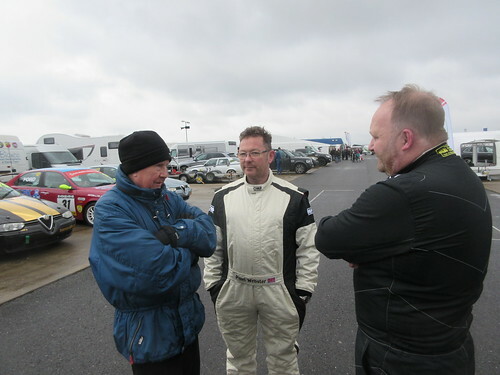 In front of him, Dave Messenger’s car had developed a misfire and Dave slowed by 3 seconds on the next lap, Richard seizing the opportunity to get through to 3rd in class. He passed Scott Austin on the next lap and moved in on Mike, breaking the lap record set by his brother James in 2012 in the process, recording a 1:11.406 on his 5th lap. 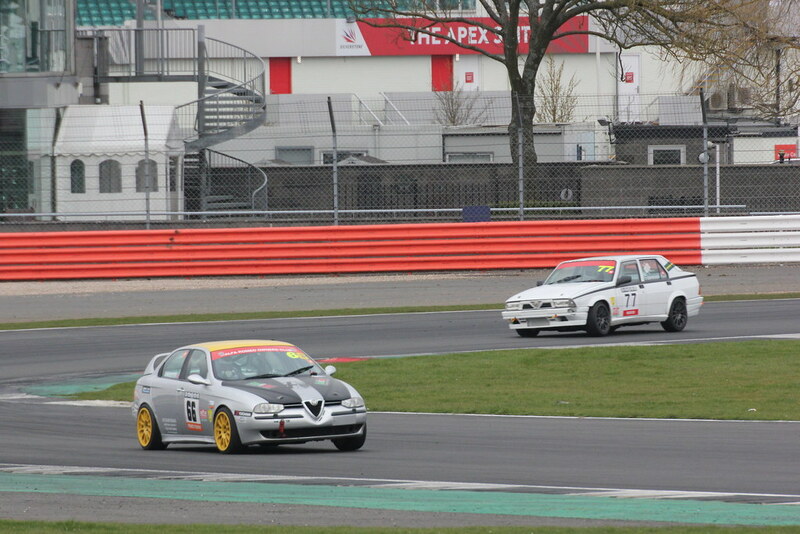 However, Mike then passed Malcolm Chapman on lap 7, giving him brief respite from Richard’s pressure. Richard passed Malcolm on lap 8 to put him back behind Mike and then passed him on Lap 12 to go 2nd in class, 4s behind Tom Hill. He gradually closed the gap over the remaining laps but Tom was still 1.5s clear at the flag. 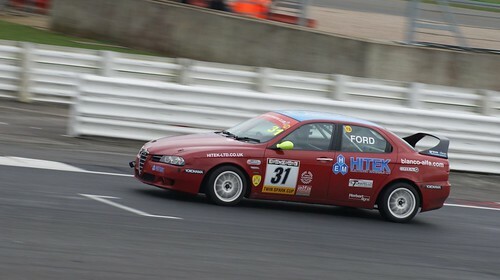 Mike Tydeman was 2 seconds further adrift to finish 3rd in class (6th overall). Andy Hancock finished 7th some 9 seconds adrift of Mike, followed by Andrew Fulcher who was the last driver to be lapped by the overall leader. 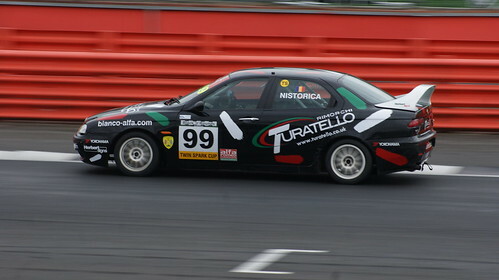 Next, however, was none other than Cip Nistorica who had got to grips with the car in the drier conditions to finish 6th in class and 9th overall, a fine effort, recording a best time of 1:12.051 on lap 11 and joining a number of drivers setting times inside the previous fastest lap time. Behind Cip was the recovering Josh Lambert, followed by Scott Austin, Riccardo Losselli and Andy Inman. 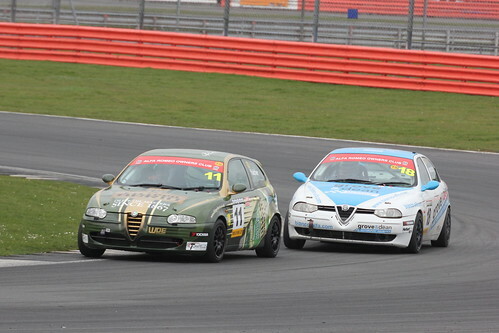 Riccardo had put in some consistent lap times and edged ahead of Andy into Brooklands on lap 13. Kristian Leith had pitted on lap 14 with a problem, rejoining 2 laps later to finish 2 laps down in 14th. So where was Dave Messenger? Luckless on this occasion, Dave pitted at the end of lap 5 re-emerging 2 laps down and continuing to circulate in the 1 minute 17s and 18s. A broken wire to a coil pack proved afterwards to be the culprit – frustrating but an excellent effort in the circumstances. 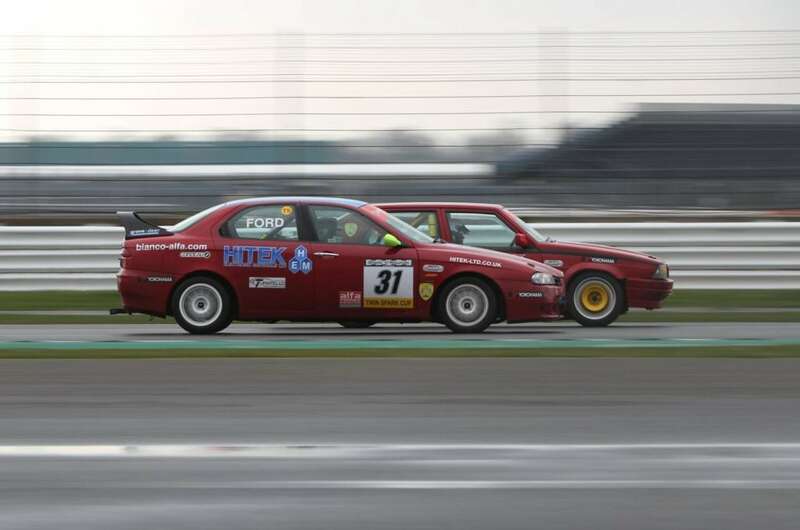 The Driver of the Weekend award was a close thing between the outstanding Tom Hill and the excellent performance by Richard Ford, Richard just clinching it by virtue of setting the new Twin Spark Cup lap record. View the points tables after rounds 1&2. 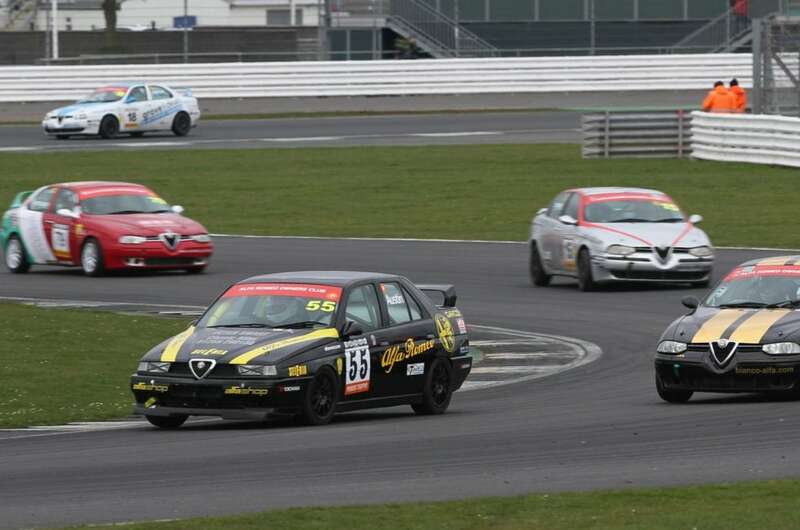 Now on we go to the Anglesey circuit on 28/29 April for rounds 3 and 4. Distance to travel is an issue for some undoubtedly but the seaside track is uniquely scenic and uniquely challenging. We need another healthy entry list so we hope many drivers will make a special effort to get there. A great weekend’s racing is in prospect!